The Breast Cancer Coalition annually offers a maximum of two breast cancer research grants: $25,000 for Pre-Doctoral Trainees or Post-Doctoral Fellows and $50,000 for Faculty Applicants. The grants are awarded to fund innovative new projects with the potential to yield significant medical breakthroughs in the cause and prevention of breast cancer, prevention of metastasis, and cure. Research proposals are solicited from regional medical and research institutions and through the Coalition’s website. Since 2003, the Coalition has awarded $851,125 to researchers in Upstate and Western New York. Attending the grant award ceremony were, from left, Coalition Research Administrator Helene Snihur; Dr. Hartmut K. Land, Professor and Chair of biomedical genetics at the University of Rochester School of Medicine & Dentistry; grant recipient Danielle Desa; grant recipient Dr. Mark Noble; Dr. Jonathan Freidberg, Director of the Wilmot Cancer Center; and Coalition Executive Director Holly Anderson. 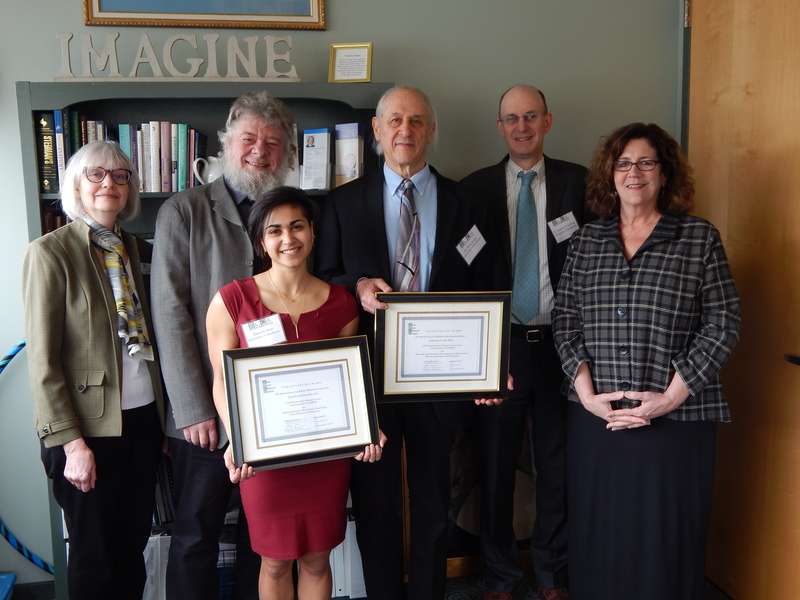 Congratulations to Danielle Erin Desa, a third-year biomedical engineering PhD student at the University of Rochester, and to Mark David Noble, a professor in the University’s School of Medicine and Dentistry. They are the recipients of the 2019 Research Initiative grants. Dr. Noble is the Martha M. Freeman Professorship in Biomedical Genetics. He was awarded the $50,000 Faculty Grant for his proposal “Biomarker and Treatment Development for Breast Cancer with Acquired Tamoxifen Resistance.” Dr. Noble will study whether a specific drug already approved by the FDA for other purposes (and for which his team discovered new properties), combined with the breast cancer treatment drugs tamoxifen and cyclophosphamide will block the ability of tamoxifen-resistant breast cancer cells to metastasize. The research will advance understanding of how resistance to the drug tamoxifen, which is used to treat ER+ breast cancer, may develop. He will also focus on diagnostics and, in collaboration with a surgical pathologist, work on developing immune-staining protocols that could prospectively identify patients with the greatest likelihood of responding to their treatments. Dr. Noble has been involved in the fields of neuroscience, stem cell biology and cancer research for more than 35 years. His studies in cancer biology are focused on developing new and more effective therapeutic strategies that also do not cause damage to the brain (a problem widely known as chemobrain). He conducted research at the Medical Research Council and the Institute of Neurology in London; headed the Cellular Neurobiology Laboratory at the Ludwig Institute for Cancer Research in London; and was a Professor of Cellular and Development Biology at University College London. Before joining the University of Rochester Faculty in 2000, Noble worked at the University of Utah, where he served as Professor of Oncology, Head of the Brain Tumor Program, and Co-Director of the W.M. Keck Center for Tissue Engineering. He is the recipient of the Jean Monnet Prize of the European Neurological Society and the Davey Award for Cancer Research from the University of Rochester. Danielle was awarded the $25,000 Pre-and-Post-Doctoral Grant to support her proposal “Understanding the Mechanisms Underlying a Novel Predictor of Metastasis.” She will investigate how the way light scatters off fibrillar collagen, a protein in the space between healthy cells through which tumor cells move, helps predict metastasis in certain breast cancers. Danielle will develop a tumor model free of other cell types, which will allow her to focus on the relationship between cell motility and the collagen properties affecting light scattering. The data from her study will be used for more complex experiments that could lead to the development of new therapies to prevent metastatic disease. Danielle holds a Bachelor of Science degree in physics and mathematics from Creighton University in Omaha, Nebraska. She received numerous awards as an undergraduate, including the University of Nebraska Medical Center Outstanding Undergraduate Research Award, and was named a Clare Booth Luce Research Scholar by the Henry Luce Foundation. Danielle holds a Master of Science in biomedical engineering from the University of Rochester, where her lab rotations included work in the University’s renowned Institute of Optics. She has contributed to several presentations at the Biomedical Optics Congress, the Annual Biomedical Engineering Society Meeting, and the United States and Canadian Academy of Pathology Annual Meeting. 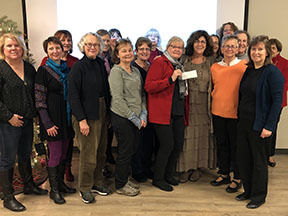 BCCR staff and volunteer members of its Research Committee were present as BCN President Bev Jasinski (cernter, red jacket) presented a check for $10,000 to BCCR Executive Director Holly Anderson for BCCR’s Research Initiative. The Breast Cancer Coalition of Rochester (BCCR) has received $10,000 from the Breast Cancer Network of WNY Inc. to support the Coalition’s Breast Cancer Research Initiative. The donation will be used to help fund research grants, which are presented annually for innovative new projects with the potential to yield significant medical breakthroughs in the causes and prevention of breast cancer, prevention of metastasis, and cure. Since 2003, the BCCR has awarded over $750,000 to researchers in The Finger Lakes Region of Upstate and Western New York. Proposals are solicited from medical and research institutions, with recipients selected through a competitive review process. The Breast Cancer Network of WNY, also known as BCN, was founded in 1988 by a group of breast cancer survivors to provide support and education to other survivors and their families. Based in Depew, BCN offers educational and wellness programs, support groups, TLC Totes to newly diagnosed patients and other services, and conducts advocacy efforts and fundraising for metastatic breast cancer research. The Breast Cancer Coalition of Rochester is a regionally-based, grassroots organization dedicated to eradicating breast cancer through action and advocacy. Formally organized as a 501(c)(3) not-for-profit organization in 1997, the Coalition is presently the only full-scope independently operated organization focused specifically on breast cancer in the Greater Rochester Region. Its Research Initiative, unusual for a grassroots organization, is an integral, tangible part of the Coalition’s commitment to eradicate breast cancer. The Coalition offers numerous free programs, including an annual Advanced Breast Cancer Seminar, monthly educational seminars, workshops, classes, and numerous support groups and programs on an ongoing basis. The Request for Proposals for the 2020 round of grants will be posted here in September 2019. 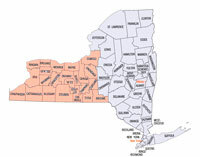 For background for future submissions, applicants must be affiliated with for-profit or not-for-profit institutions in the eligible geographic area, including the Rochester, Buffalo, Ithaca and Syracuse regions (see map below). Proposals should focus on one of the Coalition research priorities of Etiology (Cause), Prevention, Prevention of Metastasis, Cure. (585) 473-8177 or helene@bccr.org, or look at the appropriate RFP file below from 2019, Faculty or Pre- and Post-Doctoral Trainees/Fellows. The Coalition is committed to supporting and furthering breast cancer research. The Research Initiative, unusual for a nonprofit “grassroots” organization, is an integral part of the Coalition’s continuing efforts to eradicate breast cancer. Coalition grant money is intended for use as “seed money” to fund innovative new projects with the potential to yield significant medical breakthroughs. Through our funding, recipients are given the opportunity to generate the preliminary data required to apply for larger grants from major institutions such as the Department of Defense and the National Institute of Health. The Research Advisory Board, a diverse group of researchers, scientists, clinicians, and survivor advocates, keeps the research program up to date, reviews and scores proposals, and makes funding recommendations to the Board of Directors. Researchers affiliated with for-profit and non-profit institutions based in Western and portions of Central New York are eligible to apply. The funds awarded must be spent within the calendar year of the date of the grant and remain in the specified geographic area; however, travel to attend professional conferences is encouraged. The Coalition’s research grant program began in 2003 with a single grant of $25,000. The Coalition suspended its Research Initiative in 2008 to join the New York State Health Research Science Board (HRSB) grant process. For a variety of reasons, the Coalition withdrew from the HRSB and re-launched its Research Grant Initiative for the 2012-2013 fiscal year. The Coalition’s Research Initiative has awarded more than $700,000 to area researchers since 2003.